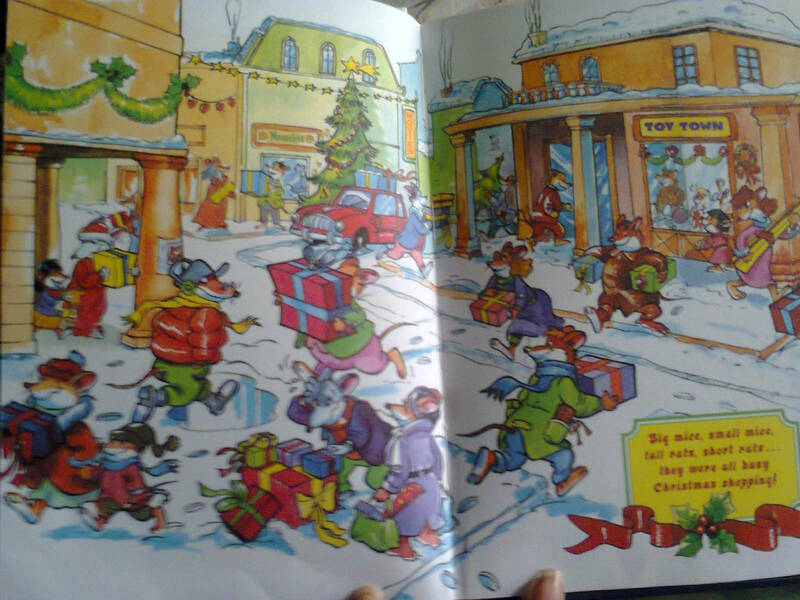 About the Book: A Christmas Tale from the popular Geronimo Stilton series of books for children is about the prerequisite of family during the occasion Christmas. 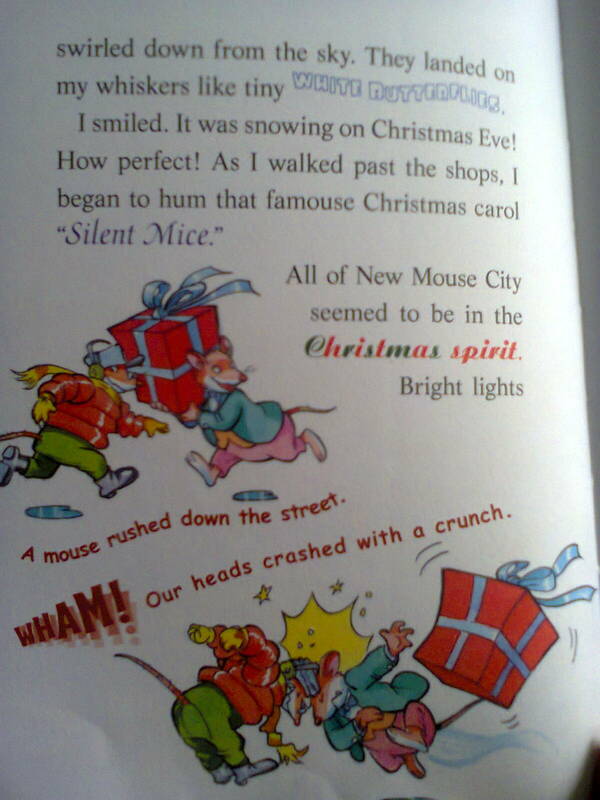 The story of the book revolves around a talkative little mouse, Geronimo Stilton, who lives in the New Mouse City in Mouse Island. When it is finally Christmas time in the city, he is extremely sad because he finds out that he will be spending Christmas all alone as his family and friends are travelling out of town. Hence, they will not be spending Christmas eve with him. Geronimo, thus, does not feel excited in the Mouse Island as he feels uninvited and left out of everything that is happening. Will this be his loneliest Christmas ? Will he spend Christmas all by himself, with the only company of his fish called Hannibal? Swarnali Speaks : I bought this cute book to read out to my little niece and I can say that this is a great book for the tiny tots to start their reading habits with. This book is a delightful and humorous read. I remember how I used to love picture books as a kid. 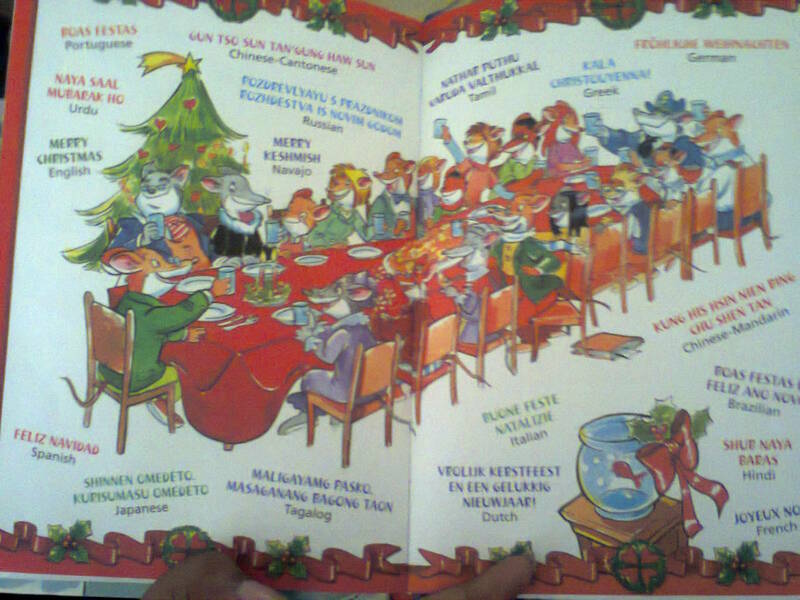 The book is filled with pictures and illustrations which not only entertain the tiny ones but also help them understand the meanings of difficult words. So they learn new word meanings and get entertained. The story is simple and is written in simple and easy words so that the kids do not find it difficult to understand. Have you ever tried to teach good manners to a kid? If you've tried , chances are the kid will forget it the very next second you teach them :P What comes as an added bonus in this book is that the story is not just entertaining and funny but also teaches the kids the important lessons of life. It tells how important friends and family are and that festivals are occasions for all to be together and have fun. It also helps them understand the importance of values like mercy, kindness, benevolence and love without being preachy. The niece loved reading aloud portions where Mrs.Ratillis (who has a cold) speaks, "Dear Gerodibo, I dan't find Doonflower" ( "Dear Geronimo, I can't find Moonflower" :D :P ). The names of places like Mouseland, Cheddarton, Mouseport, San Mouscisco, Slipper Slopes Glacier ; the names of the characters like Rattina, Mousart (our very own Mozart of mouse world :P) , Shortpaws, Spicytail, Gingermouse and Christmas carols like "Rudolph the red -nosed rodent" (reminiscent of Rudolph the red nosed reindeer) are very intelligent and entertaining You can get the kid to draw and color pictures from the book after you finish reading the book and sing along the Christmas carols. hahahahahaha this book looks hilarious. @Arpi_ Stilton is too cute...you just can't help but love the books...they're ADORABLE! !